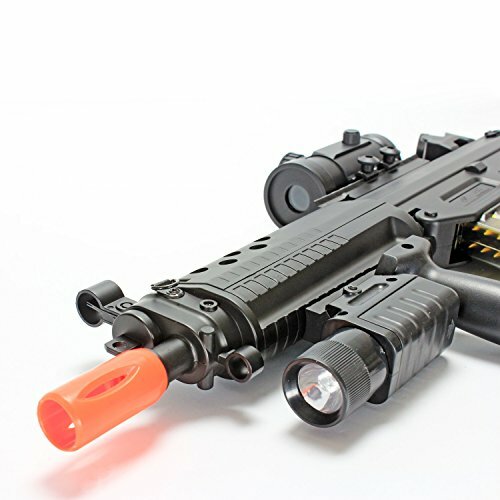 Airsoft Electric Gun (AEG) 552 style. 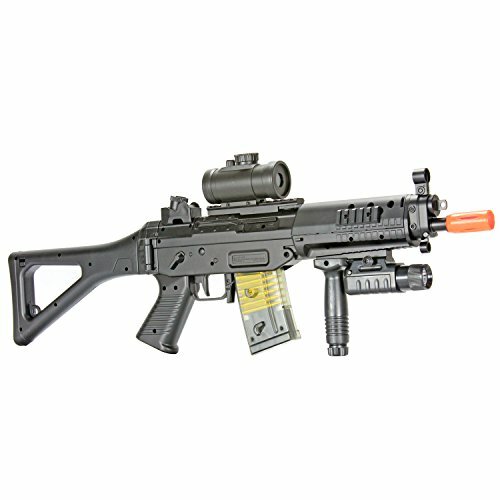 New generation Hop-Up Version Airsoft Electric Gun with Heavy Weight feel that makes it more realistic and sturdy. Motor Driven by 7.2 Ni-CD Rechargeable Battery. It has selector switch for full auto or semi-auto. Comes equipped with adjustable red dot sight. It shoots at approx 200-250 FPS with semi or full auto feature. Note that No Laser Included. 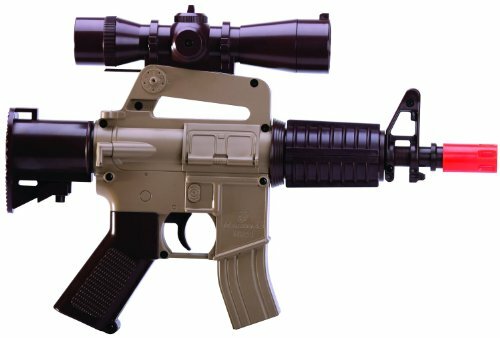 A 1:1 scale replica of an SG 552-style AEG rifle, this Double Eagle airsoft rifle is remarkably authentic. The rifle fires round 6mm plastic pellets known as BBs, which are propelled out of the gun through an electric battery-powered motor. 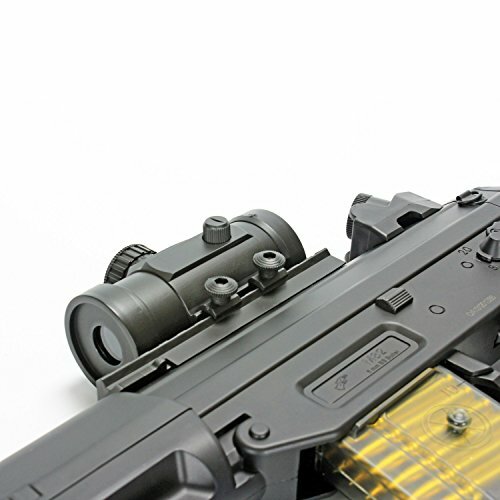 The advantage of the airsoft rifle, however, is that players can safely train, simulate, or play with the gun without fearing serious injury. 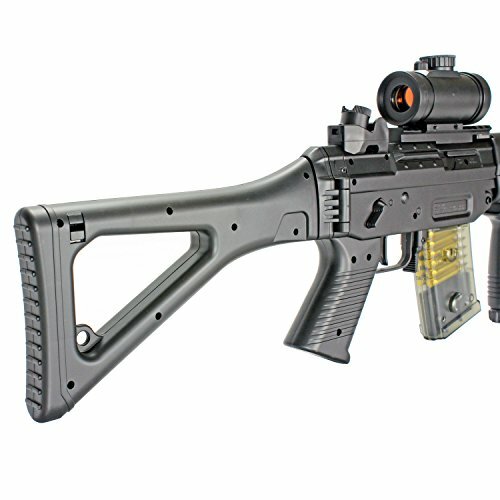 The airsoft rifle looks, feels, weighs, and functions just like a real SG 552, but is built for casual recreation rather than weaponized use. In fact, the only way you can typically tell a real-steel firearm from an airsoft rifle is the blazing orange tip and the BBs that fire when you pull the trigger. 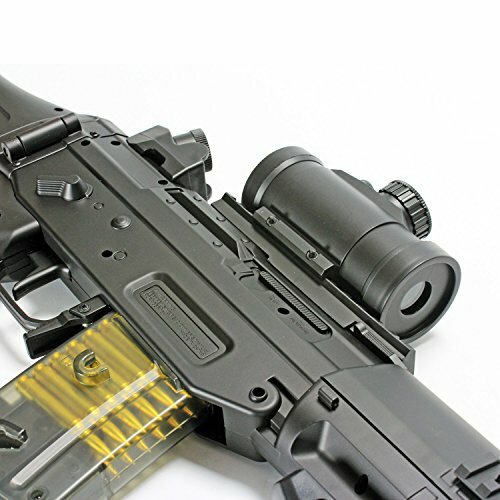 The replica rifle offers such features as a ni-cad rechargeable battery; a selector switch for full auto or semi-auto settings; an adjustable red dot sight and flashlight; an adjustable hop-up system; and a foldable stock. This item is not for sale in some specific zip codes. Due to the law and the cost, people cannot always own their dream guns. 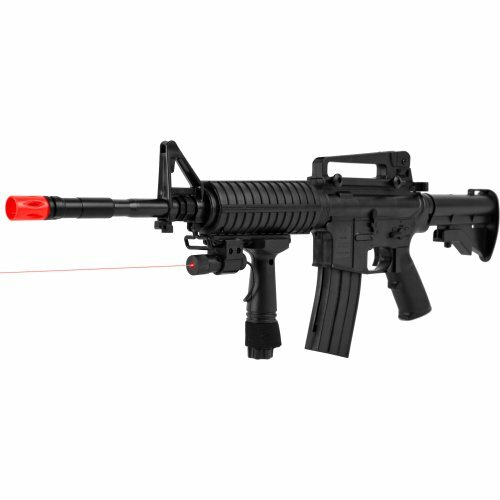 Airsoft guns, however, provide you with a realistic replica, allowing you to own a shooting (albeit nonlethal) version of that weapon. 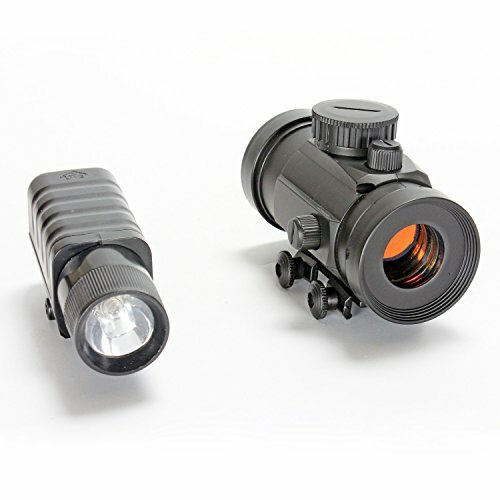 In fact, many of the weapons you often see in movies and TV shows are airsoft guns, thanks to the relatively cheap price tags and precise realism. The directors simply digitally alter the images to incorporate the muzzle flash, sound, and effects to mimic the real firearms. 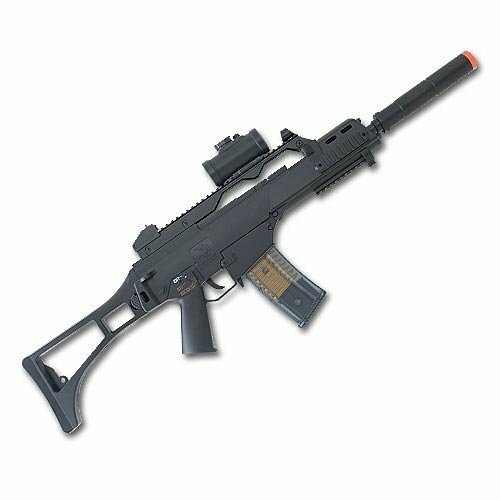 Generally speaking, most of the popular real-steel firearms have an airsoft counterpart, including the Heckler & Koch MP5 series, the venerable Heckler & Koch G3 battle rifle series, Colt M16s, Steyr AUGs, SIG 550s, FAMAs, AK-47s, M60 machine guns, IMI Uzi and Ingram sub-machine guns, famed pistols like Barettas, Colts, SIGs, and Glocks, Benelli M2 and Remington 870 shotguns, and sniping rifles like the PSG-1, M40A1, and Blaser 93R. 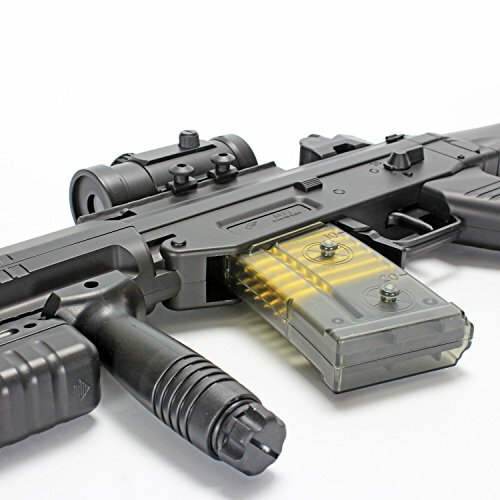 Even Hollywood guns like the RoboCop pistol and the M134 Vulcan–a six-barrel Gatling gun made famous by the Predator and Terminator movies–have airsoft counterparts. The ability to own and play with your dream guns is appealing enough to many enthusiasts. The added advantage of taking these guns to a local playing field and “shooting” your best friends in a friendly competition is a hands-down selling point. There are countless clubs, teams, and organizations devoted to the sport of “waging war” with airsoft guns, known throughout the world as skirmishing. In essence, airsoft role-playing allows people to fulfill their fantasies, which (due to physical disabilities or circumstances) they never got the chance to do themselves. These people may be bankers, insurance brokers, secretaries, students, or computer programmers by profession, but for one day a week they can be Green Berets, assassins, SWAT members, Navy SEALs, or whatever else.